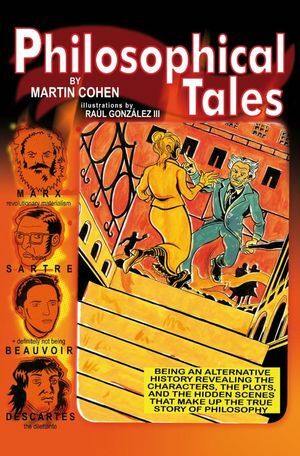 Enlightening and entertaining, Philosophical Tales examines a few of the fascinating biographical details of history’s greatest philosophers (alas, mostly men) and highlights their contributions to the field. By applying the true philosophical approach to philosophy itself, the text provides us with a refreshing 'alternative history' of philosophy. Martin Cohen is a teacher and writer specializing in philosophy, ethics and education, with a special interest in computing. His books include 101 Philosophy Problems (2nd edn., 2001), Political Philosophy (2001), 101 Ethical Dilemmas (2003), and Wittgenstein's Beetle and Other Classic Thought Experiments (Blackwell, 2005). He has been editor of The Philosopher since 1995. 1 Socrates the Sorcerer (469–399 bce). 2 The Different Forms of Plato (ca. 427–347 bce). 3 Aristotle the Aristocrat (384–ca. 322 bce). 4 Lao Tzu Changes into Nothing (6th–5th c. bce). 5 Pythagoras Counts Up to Ten (ca. 570–495 bce). 6 Heraclitus Chooses the Dark Side of the River (ca. 5th c. bce). 7 Hypatia Holds Up Half of the Sky (ca. 370–415 ce). 8 Augustine the Hippocrite (354–430 ce). 9 St. Thomas Aquinas Disputes the Existence of God (1225–1274). 10 Descartes the Dilettante (1596–1650). 11 Hobbes Squares the Circle (1588–1679). 12 Spinoza Grinds Himself Away… (1632–1677). 13 John Locke Invents the Slave Trade (1632–1704). 14 The Many Faces of David Hume (1711–1776). 15 Rousseau the Rogue (1712–1778). 16 Immanuel Kant, the Chinaman of Königsburg (1724–1804). 17 Gottfried Leibniz, the Thinking Machine (1646–1716). 18 Bishop Berkeley’s Bermuda College (1685–1753). 19 Headmaster Hegel’s Dangerous History Lesson (1770–1831). 20 Arthur Schopenhauer and the Little Old Lady (1788–1860). 21 The Seduction of Søren Kierkegaard (1813–1855). 22 Mill’s Poetical Turn (1806–1873). 23 Henry Thoreau and Life in the Shed (1817–1862). 24 Marx’s Revolutionary Materialism (1818–1883). 25 Russell Denotes Something (1872–1970). 26 The Ripping Yarn of Ludwig Wittgenstein (1889–1951). 27 Heidegger’s Tale (and the Nazis) (1889–1976). 28 Benjamin Lee Whorf and the Color Pinker (ca. 1900–1950). 29 Being Sartre and Not Definitely Not Being Beauvoir (1905–1980 and not 1908–1986). Scholarly Appendix: Women in Philosophy, and Why There Aren’t Many. Key Sources and Further Reading.